I've tried to identify the episodes in which the music was used, and the episodes from which the dialogue comes from. There are some holes still (tracks 11, 17) -- any help to get rid of those question marks is welcome. 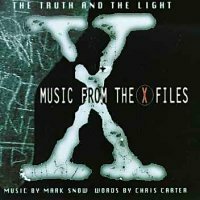 Second part (1:42-end): 3X14: Grotesque G.Anderson (Scully) must have recorded these just for the CD release: "Truth"; "Deny"; "Everything"